Three pairs of luxury Ted Baker ‘Biker’ socks for men made from organically produced cotton presented in signature card packaging. 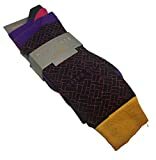 Sock 1 68% Cotton, 25% Polyester, 6% Polyamide, 1% Elastane. Sock 2: 85% Cotton, 13% Polyamide, 2% Elastane. Sock 3: 85% Cotton, 12% Polyamide, 2% Polyester, 1% Elastane. One Size. This entry was posted in Gothic Discount Clothing and tagged BAKER, Biker, Cotton, Hoisted, London, Mens, Organic, Pairs, Size, Socks by Vivid Dark. Bookmark the permalink.